A New Hampshire town held over the Labor weekend the Exeter UFO Festival to mark the 50 years that Norman Muscarello, then an 18-year-old high school graduate, claimed to have seen an unidentified flying object (UFO). The event was dubbed "The Incident at Exeter" because it led the U.S. Air Force to investigate the claim made by Muscarello who is now dead. It became one of the most observed and scrutinized sightings, reports Associated Press. There had been books, movies and documentaries made about the incident. Among those who attended the festival are known UFO observers, believers in aliens, doubters and the curious who attended to raise funds for children's charities. Exeter hax been holding the annual festival which had been sponsored by the Kiwanis Club of the Exeter Area six out of seven straight years. Bill Smith, president of the club, said the Kiwanis is sponsoring the festival because few residents are now talking about the alleged UFO sighting. "Nobody recognized the significance of the event anymore," Smith laments. Muscarello was hitchhiking home on Sept. 3, 1965 when he saw lights in the woods near Kensington. He panicked when the lights moved toward him. He dove into a ditch. When the lights returned to the woods, Muscarello hitched a ride with a motorist and reported the incident to the Exeter Police Department. An officer returned with him to an empty farmhouse near where Muscarello saw the light. The officer also saw it, and eventually there were reports of similar sightings in the area. But a U.S. Air Force investigation attributed the light to a mirage due to temperature inversion or one of the five Air Force B-47 jets in the area. The festival attracted 600 to 700 people. 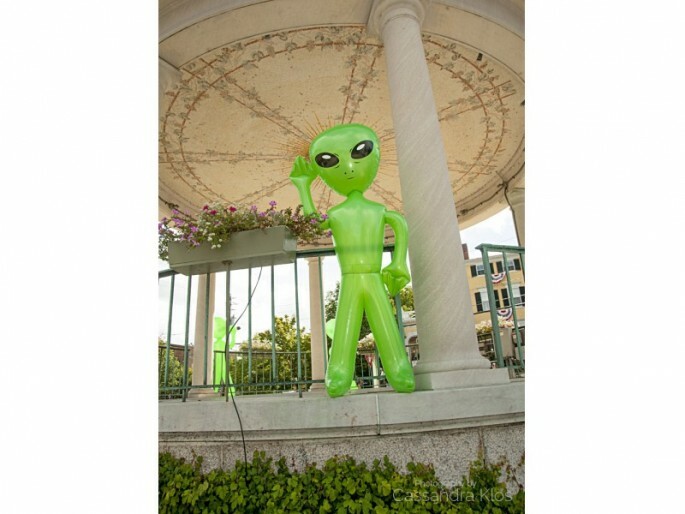 Besides talks from UFO researchers such as Stanton Friedman, Richard Dolan and Jennifer Stein, the festival featured souvenirs for sale, including tiny green aliens, spaceship models, T-shirts and coffee mugs. Audience to the talks were asked to donate $10 to cover the rising cost of mounting the festival, according to Exeter Patch. There is a similar festival in Roswell, New Mexico, held every July, which draws bigger crowds. Roswell is where an alleged UFO crashed in 1947 which sparked debate in the U.S. if there is alien life outside Earth.